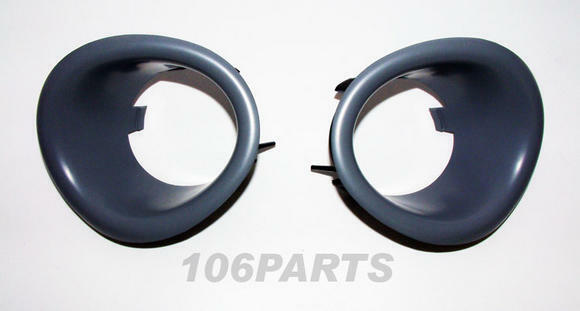 FRONT BUMPER ROUND INSERTS. These are fitted on Rallye models instead of front spot lights. They are useful for brake cooling and attaching air feeds to. Very common for these to get damaged. Supplied in grey primer ready to be sprayed any colour. PEUGEOT 106 RALLYE 1.6 8V 97-98. Part Description: FRONT BUMPER ROUND INSERTS. These are fitted on Rallye models instead of front spot lights. They are useful for brake cooling and attaching air feeds to. Very common for these to get damaged. Supplied in grey primer ready to be sprayed any colour. PEUGEOT 106 RALLYE 1.6 8V 97-98.